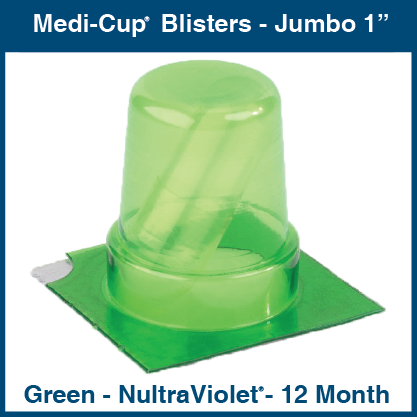 Medi-Cup Blisters - Jumbo 1"
Choose 12 month (green, USP Class A) or 6 month (amber) rated beyond use dating. 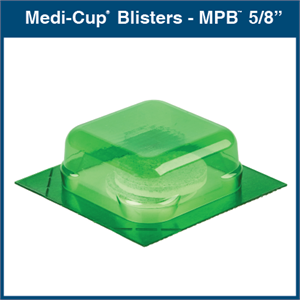 When used with our Lid Label Covers, Medi-Cup Blister Sheets provide a Tamper Evident, Moisture Resistant Package. 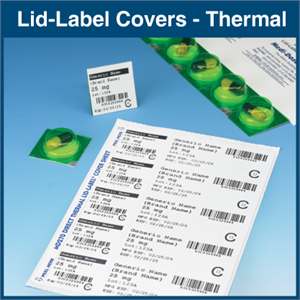 (All packages conform to USP 41 Total Package Testing Method). 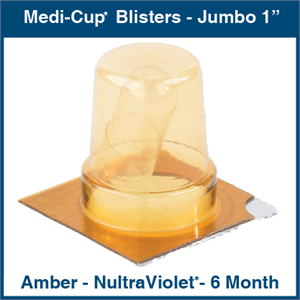 Nultraviolet Medi-Cup Blisters are over 97% effective against the UV Spectral Range. 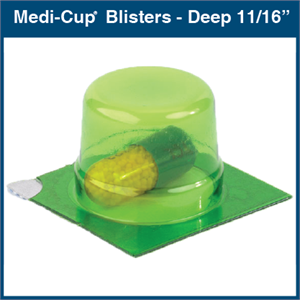 Semi Rigid construction and design protects physical integrity of medications, preventing powdering, crushing or breakage. 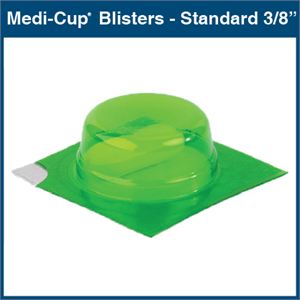 De-Nesting Hip provides easy separation of sheets. 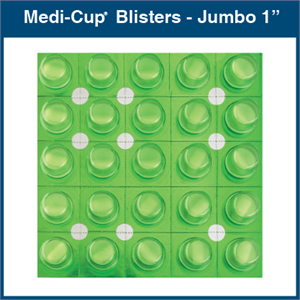 Each sheet provides a clean surface for packaging medication, significantly reducing the risk of cross contamination. 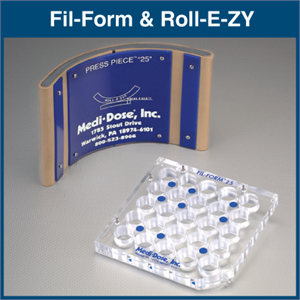 All components of The Medi-Dose System are manufactured from FDA acceptable materials. 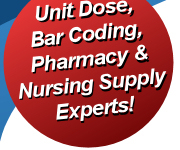 The easiest way to bar code and unit dose your solid oral medications! 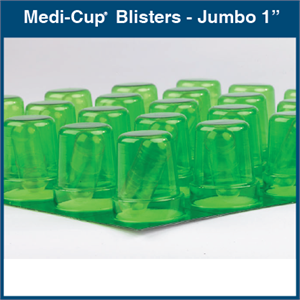 Print fewer doses at a time. 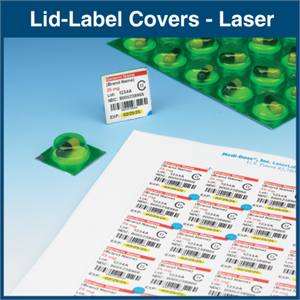 Ideal when storage space is at a premium. 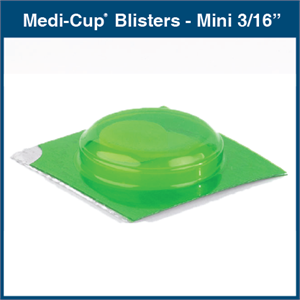 Our best selling blister! 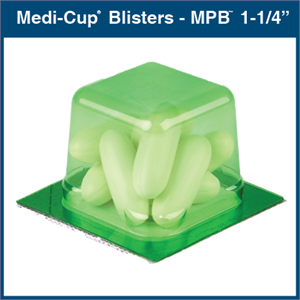 The perfect balance of being large enough for most medications, yet small enough to fit in most dispensers and storage spaces. Ideal for packaging compounded meds, veterinary drugs or large medication, like double or triple "0" capsules. 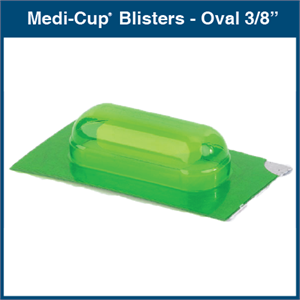 Ideal where smaller storage spaces or specific dispensing devices are required.